When I wish to cook rice, I have a tendency to become muddled as to the best way to prepare it, while contemplating what pan to use and should it be boiled or steamed. During these attempts I have managed to ruin some meals, damaged pots and unfortunately tossed rice into the garbage due to poor stovetop cooking. Thankfully cooking rice has been simplified by the Zojirushi Neuro Fuzzy rice cooker! The revolutionary Zojirushi NS-ZCC10 is compact and white in color so it blends easily with kitchen furnishings. Its control panel display features a timer function and clock. Whether for home, professional or commercial need, users appreciate its retractable cord, which plugs into any electric outlet, keeping a counter orderly. This machine has top features which are beneficial and programmable to create perfect rice. There will be no more need to worry about burned rice because you choose the texture you want (soft or hard), which is saved in its menu memory until you decide to change it. Among its best rated features is its ability to keep the rice warm without dryness or discoloration. 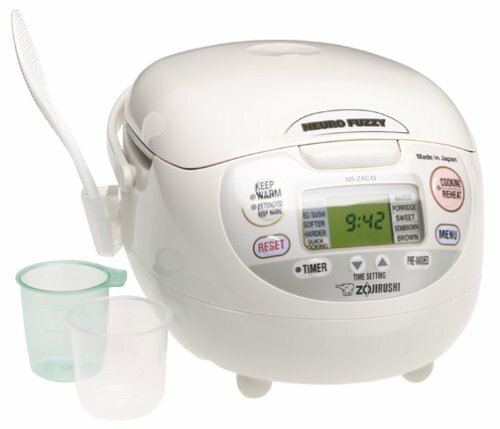 The Zojirushi provides ease in knowing that you will make flawless rice every time. After making this small investment, you will never want your kitchen to be without one!